We have just added a new "Like" button next to every large image on the website! As you find images you like and want to send some love to the artist, just click the new "Like" icon. The number of total likes an image has will also display to the left of the image. Additional upgrades and reports using the new Like feature will be coming soon. 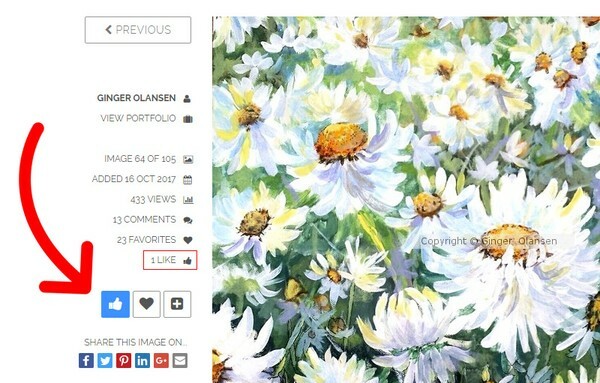 We have added a "Follow Artist" icon (plus sign) on each image of your portfolio to make it easier for fans to follow the artist. Following an artist adds them to the daily Art Watch e-mail as well as the Art Feed. The "Add to Favorites" icon (heart) is now larger to encourage more likes/favorites. All your favorite Images can be viewed on your Art Feed page. We hope everyone can get click happy with the new LIKE button to give positive feedback to the artist/photographer. Comment with any feedback or questions you have on this new feature. It is a great idea! Then you can have a yearly reward for most likes, 1st, 2nd, 3rd? An idea! I really like the improvements made to the site. I never thanked you for using my name here! Thank you! Nice idea, But, I do most of my AW on my phone and since the icon is on the side of the art work it does not show up on my phone. Only if I'm on the computer do I see it at the side. Would be great if you would put the icon under the art work along with the "favorite" and " see portfolio:. Thanks for the feedback Joanie - In 2018 we will be making some big improvements to our mobile experience, so you can do everything on your mobile that you can do on the desktop. Himalayas. Screen in 4 parts.